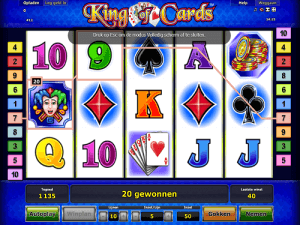 This playing card-themed slot machine, brought to you my NovomaticCasino.co.uk, is fit for a King. For those of you who enjoy playing Mega Joker and Book of Ra Deluxe – this slot game is just for you and is not to be missed! With 5 reels and 10 paylines, this slot is full to the brim with exciting features, colourful symbols and lucrative bonus games. It’s great for beginners and it’s relatively simple to understand and play, and also great for those expert slots players who are looking to go back to basics, but who are bored of all the fruits and bells! Why not give it a go and see if you can play your cards right? All of the cards in King of Cards are card-themed! The card values from 9 through to Ace are the lower-paying symbols. The main aim of the game is to spin at least two or three matching symbols (depending on the symbol) on a winning payline, on consecutive reels from left to right. If you manage to spin 5 of any of the suit symbols: hearts, diamonds, spades and clubs or the royal flush of hearts, you can win way more than several times your bet! The joker himself is the Wild symbol and he substitutes for all symbols except the Scatter and doubles the payout when he falls in winning combination! The Scatter symbol is a stack of gambling chips and these pay wherever they land on the reels. As with most other NovomaticCasino.co.uk games, you can play for fun until you’re ready to play with and win real money. Your bet is always clearly shown for you at the bottom of the screen, in the middle, with your winnings to your left and your last win on the right. You can change your bet any time, by increasing or decreasing the number of lines you wish to bet on and the amount you wish to bet on each line. If you’re unsure of how much each combination will pay out, you can take a look at the paytable which will give you the exact figures according to your bet, as well as more information about the game. Once you’re happy with your bet, you can put the game into ‘autoplay’ mode and let the reels spin themselves! King of Cards has some wild cards up its sleeve! Each time you get a win in this slot game, you can gamble the about using the classic double-or-nothing gamble feature. All you need to do is have the courage to click ‘gamble’ instead of collect and guess the colour of the next card: red or black. If you guess the correct colour, you’ll double your win amount and you can keep doubling as long as you keep guessing correctly, otherwise you’ll be back to the reels with nothing. What’s more, King of Cards offers free spins! All you need to do is spin three or more Scatter symbols and you’ll be given 15 free spins! During the free spins, you can win more free spins, but the best thing about the free spins is that any winnings you gain will be multiplied by three! Here at NovomaticCasino, we have many more slots and video slots – and many of them have jackpots, like: Mega Moolah and Garden of Riches. Aside from the extensive selection of slots and video slots, NovomaticCasino.co.uk also has a variety of table games and live dealer games. Our table games offer great RTP (return to player percentages) and our live dealer games are brought to you using the very latest technology which make them super engaging and realistic!